Kaspersky Update Uitility 3.0 can be run via Microsoft Windows Task Scheduler. Using the option Run whether user is logged on or not, you can run the utility on the computer with no user logged on. Make sure your computer is connected to the Internet. It is required for checking the licenses of the updated applications. Without the Internet connection, the update task cannot be finished. Temporary folder / Update folder (only the absolute path is accepted). Create a Microsoft Windows Scheduler task that runs the console version of the utility (UpdateUtility-Console.exe). Run Task Scheduler by typing taskschd.msc /s in the Start menu search string. Select the Create Basic Task item in the right frame or in the Action menu. Follow the wizard directions. Specify the name and the schedule of the task. At the Action step, select Start a program. 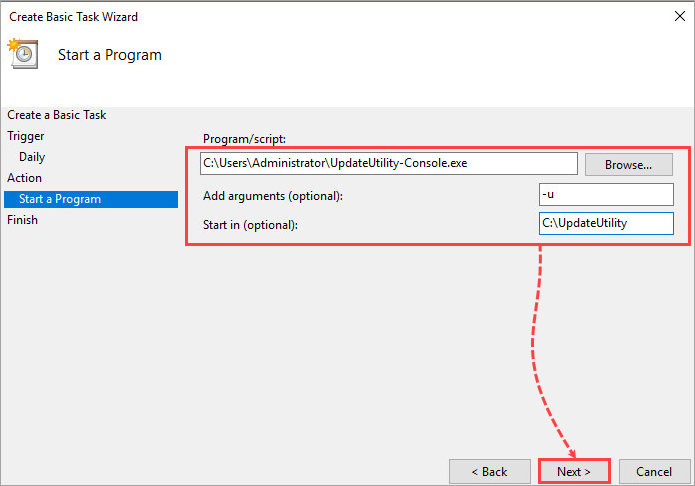 At the Start a program step, specify the full path of the UpdateUtility-Console.exe file. In the Add arguments box, specify -u.
Click Finish at the last step. 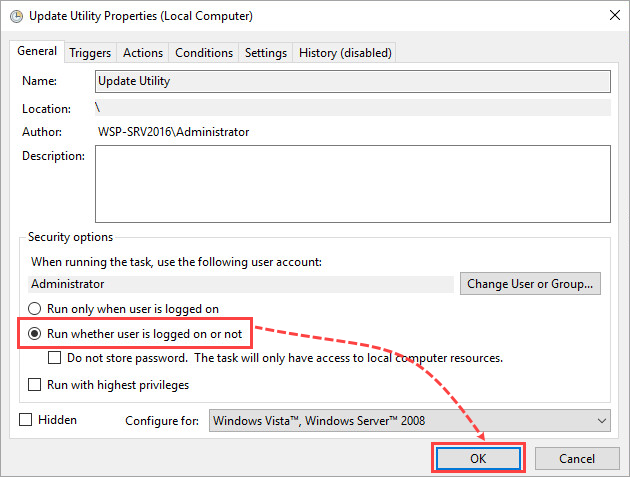 Open the task properties and select the option Run whether user is logged on or not. Make sure the user account you specified has the required privileges. Kaspersky Update Utiliy 3.0 will be run according to the schedule even when no user is logged on.